Backup cameras are an oft-overlooked necessity for all vehicles, and every driver can use the assistance of an extra pair of eyes while on the road. While you love the reinforcement a backup camera can give you, you may not like having a monitor in your way and on display at all times. The 3.6" Pop-up Monitor with 90° Backup Camera tastefully sits flat on your dash until you are inclined to use it. Our 3.6” pop-up monitor delivers crystal clear image quality each time you turn it on, and it holds many of the exciting features of our larger monitors. Enjoy the vibrant color and two video inputs to use for additional cameras, DVD players, or video gaming consoles. Installation is quick and simple and the monitor is able to connect to any power source. This monitor is ideal for those who want the least invasive piece of equipment possible. Small and compact, this monitor carries out the same functions as its larger counterparts. 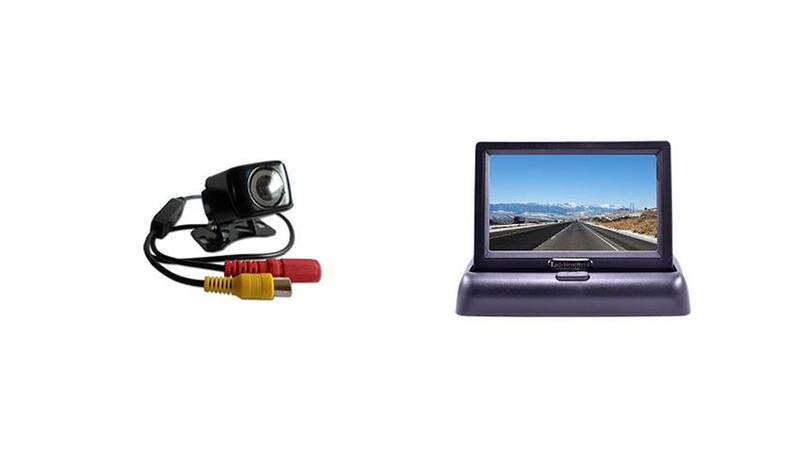 Our ice cube camera that comes along with the 3.6" Pop up Monitor with 90° Backup Camera system is recommended for use with smaller vehicles such as cars, trucks, and SUVs. A 90° viewable angle will give you just the right amount of monitoring to see what stands in your way of a perfect park job or lane change. Easily mount this camera to your bumper, or if you wish to have a bird’s eye view, go ahead and place it higher on your vehicle. Durable and reliable, this camera won’t let you down. Order your 3.6” pop up camera system today! "Was looking for a small camera to mount on my truck and this fits perfectly. This nice little camera is all i need to get my work done. It's perfect with any of their Monitors as their salesperson explained. Went with one of their smaller Pop-up Monitors and got to say small camera and small monitor equals great picture"